Standing in front of the Hall Building at any given time, even on the coldest of days, it would be difficult not to notice the traffic of the bike lane. As pedestrians avoid Montreal’s treacherous winter conditions by taking the many indoor and underground paths through the downtown core, cyclists padded in layers of clothing ride back and forth, dodging potholes and dangerous drivers. Many of these cyclists are commuting to work or school, avoiding the equally treacherous conditions of the STM during rush hour. But as the app-based food delivery industry grows internationally, it’s increasingly apparent how many of the cyclists crossing downtown are already at work, delivering large, branded, insulated bags of food to offices and homes all over the city. On Feb. 13, several couriers at a major Montreal paper messenger were let go for refusing to work during a snowstorm. That day, a storm blanketed Montreal in 30 cm of snow, resulting in the closure of schools, offices, and businesses across the city. When the couriers voiced their concerns to their employer, they were told that not working would be in violation of their terms as contract workers. As paper couriers, messengers are hired as “independent contractors,” which means that despite their positions functioning exactly as an employee, they are denied the status of an employee. Their work is seen as precarious, dependent on a fluctuating economy and freelance or contract agreements that leave them without the rights many workers are afforded. This status is what provides workers with basic labour rights such as sick days, vacation pay, and the right to refuse work in dangerous conditions. A high turnover of workers and looming threat of unemployment often stops those currently employed from mobilizing towards change. Kris, who asked to remain anonymous because of legal action being taken by their former employer, was one of those fired couriers. He explained how their precarious position as contract workers also deny them the benefits that independent contractors truly do have, such as having their hours set for them, being provided company IDs as well as control over the conditions of their contracts. Kris explained why his former employer, and so many messenger services in North America, are significantly behind on their approach to wages and workers’ rights. “We’re providing an essential service for multi-billion-dollar, international, white collar businesses, as long as there are physical items that need to be traded between businesses—ones that can’t be sent electronically—we’ll be around to deliver them,” he explained. “The impact of first fax machines and now email have made courier companies desperate to cut costs. This is why our rates haven’t changed in 20 years due to intense competition between courier companies,” said Kris. Generally overlooked by the corporate and civilian interactions they encountered, bike couriers gained interest generated by media representing them as urban cowboys of the counterculture in films like 1986’s Quicksilver and 2012’s Premium Rush. The narratives of the films themselves depict educated, privileged men in high stress corporate worlds, leaving their powerful positions and finding themselves in a community of bike messengers and regaining their joy for life on the streets of New York. The films are examples of male fantasy more than an accurate illustration of the job. With the growth of available employment as a bike courier in a time of app-reliant, gig economy professions, what’s missing from the representations of bike couriers is an awareness of the working conditions within the industry. 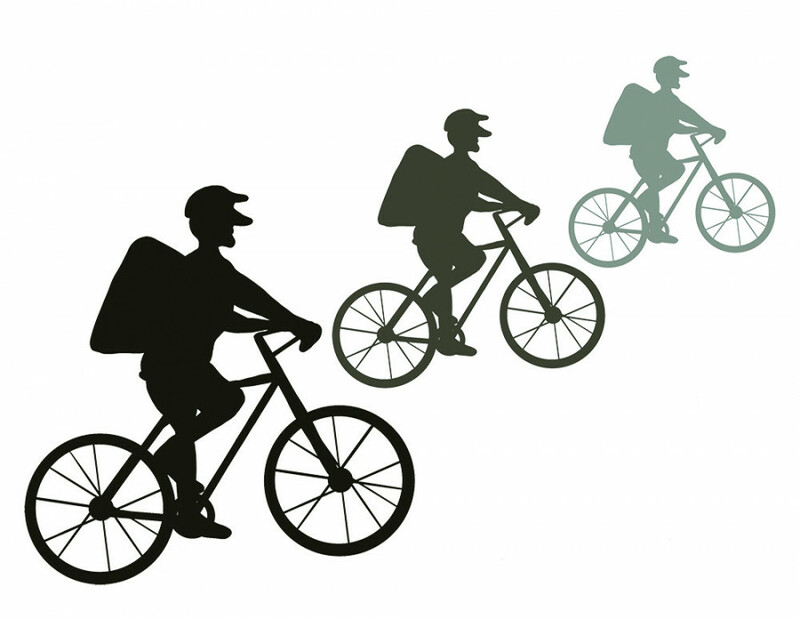 In May 2014, a group of Montreal bike couriers who found they were unhappy with their working conditions came together to form Chasseurs Courier, a local, courier-owned messenger service that aimed to address many of the labour issues within the industry. Sam Davids, an employee, spoke with The Link about beginning a courier company whose primary goal was to put riders first. “I think a secondary motivation was to diversify the kinds of work bike messengers can do—doing after hours and weekends, and delivering food as well as paper and packages,” said Davids. Food deliveries ended up being a large part of Chasseurs’ income as, until several months ago, their service worked with one of the city’s biggest food delivery platforms, Just Eat. These changes resulted in downsizing the already small company, and more non-food deliveries taking up a larger proportion of their business. Chasseurs is different from other bike delivery services in the city as it’s not only independently owned, but deliveries are done almost 100 per cent by bike. Instead of the delivery fees going towards corporations who own most other companies, delivery fees go straight to the riders. Chasseurs met the challenge of losing one of their many sources of income by developing their own food delivery platform. This fall, Chasseurs soft launched SupMtl.com, their response to the changes in the food delivery industry. Food orders can now be placed through the site to several prominent, locally owned Montreal restaurants comprised of a number of Chasseurs’ former clients who stayed for their transition to Sup. Chasseurs also maintains a store front office space in the Plateau, a central location between their diverse business clients. The office provides a warm place for riders to rest between calls, a perk that doesn’t exist for those working for most app delivery services. Still, the growing popularity in app delivery services means that riders for these apps have the potential to earn more than they might have working as paper couriers at smaller companies. Kris recognizes how before app jobs, it was difficult to find a job as a courier without already knowing someone working for a company, and the job used to be solely full time. Many of these factors explain the recent influx of app delivery riders in Montreal, as the job requires no French and allows part-time work. As a result of some of the downsizing that occurred at Chasseurs, several of the riders have found themselves working shifts both for the independent company in addition to app delivery services. This includes Ash Desmarais, a Chasseurs courier who said Foodora allows them to pick up extra shifts. “Every single person who works at Chasseurs dispatching is also a rider. They know the ins and outs of the job and they listen to the issues that are affecting their friends and co-workers. It feels like friends who have your back, and care about you at Chasseurs, whereas with apps it feels like talking to a robotic company manual,” they said. When delivering for Foodora, Desmarais can complete eight to 15 deliveries per day, putting them just above minimum wage. Desmarais continued that it can be especially discouraging that many of the customers who use food apps seem to not appreciate the difficulties of the job, recounting a Montreal Reddit post in which a user boasted about how they didn’t tip bike couriers delivering food in the winter as his food could arrive cold. “If you are having food delivered directly to you, while you sit in your undies and spew nonsense on Reddit, the least you can do is spare a few dollars to the person risking frost bite to bring it to you,” they said. Desmarais explained that a great deal of care is taken to keep food warm, but acknowledged that there is always a risk when ordering food in sub-zero temperatures. Despite a clientele who are often ignorant of the challenges created by construction and harsh weather, each rider spoke highly of the diverse community they’ve found in the bike couriers of Montreal. Kris elaborated on the unique culture of messengers in the city, which is diverse not only in part because of the divide in French and English speaking riders, but also in regards to the variety in age and education—with many couriers holding Masters degrees, and yet many still having only completed some of high school. This unique blend of socio-economic status provided an ideal environment for messenger culture to develop into a social and political counterculture for what Kris refers to lovingly as the “freaks and weirdos” who occupy most of Montreal’s courier communities. Desmarais supported this statement. “Here, they, for the most part, actively encourage women, non-binary, queer and trans riders,” they said. The diversity among bike couriers might also provide insight as to why their occupation leaves them vulnerable to exploitation from their employers—as a community of marginalized people including the LGBTQ+ populations and the large minority of Anglophone workers in Montreal—given that their work is dependent on the ebb and flow of the economy and freelance or contract agreements that leave them without workers’ rights. However, as the economy continues to move away from accessible full-time positions with benefits, the diversity within delivery jobs is expanding to include members of mainstream culture, now excluded from the secure positions post-secondary education had once promised in the past. With this change comes hope for delivery cyclists to gain the job recognition they might need for employers to reconsider the status and rights of their workers. When asked what both app services and traditional courier companies could be doing to better support their riders, everyone provided similar responses. “It’s as simple as taking into account and making changes based on what the riders are saying will make a difference. The riders are speaking; they just need to listen,” said Desmarais.